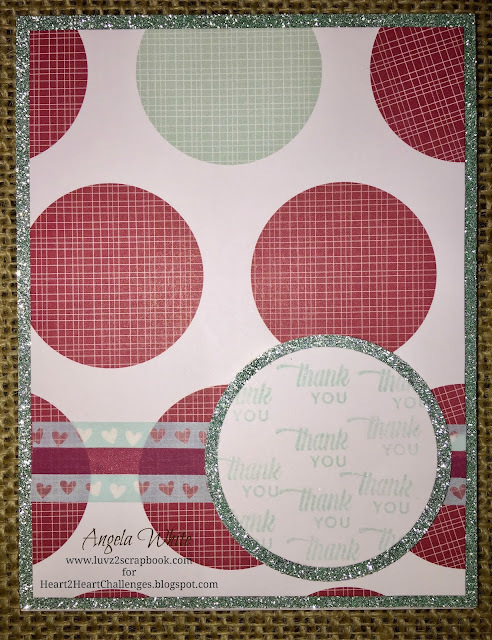 Welcome to my blog, this week's Heart2Heart Challenges theme is "Round and Round", my project this week features the Sugar Rush Patterned Paper and the Short and Sweet Stamp Set. I also used some of the Sea Glass Glitter paper to help the round shapes pop out. Since the Thank You sentiment is a mini stamp, I thought it would be a great idea to stamp it multiple times on a larger circle so that it can be more visible. I also used the Clear Shimmer Brush over the Thank You sentiment to give it a little sparkle.